I just love that little kitty hiding in the snowman and thought he'd be perfect in the middle of my puppy snowball fight! 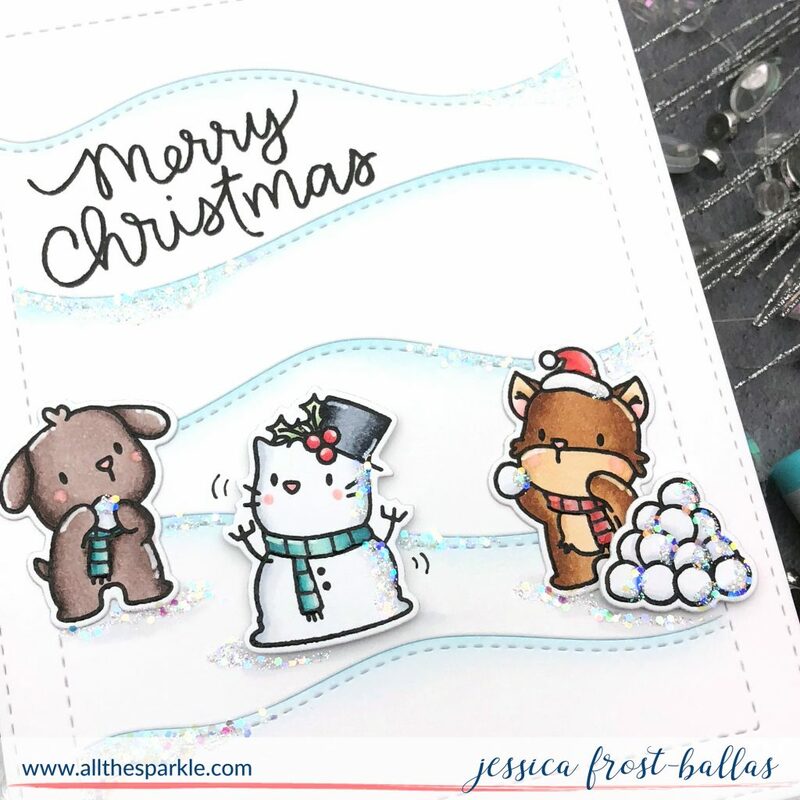 To start I stamped the snowballs, pups, and kitty from Happy Woofmas with Versafine, heat-embossed them with clear embossing powder, and colored them with Copic markers before die-cutting them with the coordinating dies. I added a few accents with a white gel pen, spectrum noir clear sparkle, nuvo crystal glaze, and chunky and prisma glitter! Next I die-cut the Hillside Cover die from white cardstock and used post-it notes to mask each hill layer so I could blend a little tumbled glass distress ink on the tops of each hill. I stamped the sentiment from Scripty Xmas with Versafine and heat-embossed it with clear embossing powder. I adhered the cover die to a white card base and added my critters with a mix of regular adhesive and foam mounting tape. Finally I added a little liquid adhesive to parts of the hills and sprinkled them with chunky and prisma glitter for a little extra sparkle! And that's it! Pretty clean and simple but with a little pop of sparkle...just the way I like it! I love this card. The poor kitty snowman is going to get caught in the crossfire! 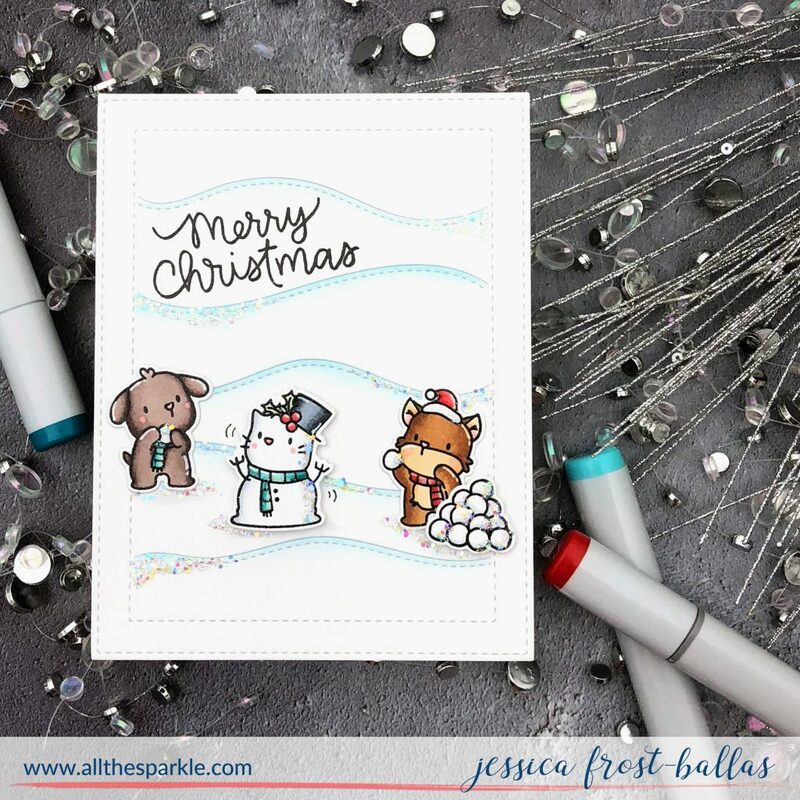 Such a cute scene on your fun card! Cute card. Love the glittery accents you added. So adorable! That kitty looks a little stressed trying to stop the snowball fight! Lol! Super cute critters on this CAS snowy scene card!